Those who would like to see offshore wind power in Delaware will be interested in the progress of a similar proposal in Massachusetts. The Boston Globe reports that an offshore wind project has gained state approval in Massachusetts. The developer of a Nantucket Sound wind energy project hopes to begin producing clean energy by 2010, after winning final state environmental approval yesterday, but the project still faces a major remaining hurdle: an expansive federal government review. The Interior Department plans to release a draft report next month, but will not finish its review until early next year. And well-funded opponents, who have dogged the project for six years, waging legal and political warfare in efforts to derail it, are likely to challenge the permits required to build the wind turbines off the Cape and Islands. A power plant proposed for the Millsboro area could increase Delaware's statewide greenhouse-gas output by 50 to 60 percent or more at a time of rising global pressure for cutbacks, according to newly released details about the project. The NRG Energy disclosures about its next-generation coal plant are expected to focus more attention on coal plant emissions and company plans to inject a majority of the waste carbon dioxide deep beneath Millsboro -- an option based on untested assumptions about Delaware geology and undetermined rules for "sequestering" the waste gas in deep, local wells. "There's no hiding the fact that, unsequestered, the NRG proposal will significantly increase CO2 emissions," said Philip Cherry, a Department of Natural Resources and Environmental Control policy manager and member of a team now considering power plant bids by NRG, Conectiv and Bluewater Wind LLC. NRG has proposed to capture a portion of carbon emissions from the new plant, provided that rate payers pay for the capital equipment. With this newly released batch of documents, we may be able to better estimate how big that cost could be. Charles Copeland might want to get Karl Rove on the phone. 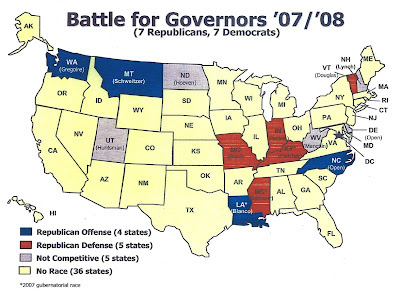 Boy Genius and the once vaunted White House political operation don't think the GOP can win the Delaware governor's race in 2008. I’m guessing that Charlie Copeland, who is considered the GOP’s leading candidate for governor in 2008, would not have wanted to learn that he doesn’t have a chance via a congressional hearing. But the PowerPoint presentation found its way from the GSA to Capitol Hill, and thus to headlines across the country. What does the GSA have to do with politics? That’s what the House Oversight and Government Reform Committee was trying to figure out when GSA administrator Lurita Alexis Doan was called to testify yesterday. The GSA may be the most boring federal agency in existence; it manages federal government property, motor vehicle fleets and purchases of furniture and office equipment. So what was the White House political operation doing briefing the GSA staff on strategy for the 2008 election? Under sharp questioning, Doan acknowledged attending the videoconference. She and up to 40 of the agency's Republican appointees scattered around the country watched a PowerPoint presentation by J. Scott Jennings, White House deputy director of political affairs, who works for Karl Rove. On at least 10 occasions, she testified that she could not recall asking employees to help the GOP or remember details of the presentation. "I'm a little bit embarrassed to admit this, but I can say that I honestly don't have recollection of the presentation at all," she said. It has become increasingly apparent that Bush and Rove have been politicizing everything that isn’t tied down in Washington; it seems that no corner of government is too trivial to be co-opted into their political machine. The unintended consequence is that their precious political intelligence has been opened to public inspection. And the Delaware GOP has found out via a congressional hearing that the governor’s race here has already been written off by the know-it-alls in Washington. By stepping down, Atkins ended the controversy over his conduct during and after an Oct. 29 traffic stop in Ocean City, Md. Some of his colleagues said the apologies in his speech came way too late, particularly when set against his combative attitude since the incident. There was contrition, but contrition was what his colleagues had wanted to see months ago. "If he'd done that at the beginning, he would have survived," said John Flaherty, lobbyist for Delaware Common Cause and a longtime legislative observer. What I’ve heard from inside Leg Hall confirms the general impression that John Atkins had worn out his welcome. Legislators are like the rest of us; they don’t like being lied to. John Atkins lied to his constituents days before the election. He lied to reporters. He lied to his colleagues. At one point he lied in a sworn affidavit. The last straw for some was the revelation that he coached the family babysitter in how to answer questions about the events of October 29. By then it was easy to assume that Mr. Atkins was asking her to lie. His lies fit the dictionary meaning of “an intentional untruth.” He did not want voters, the media or his colleagues to know the truth of his tawdry conduct. John Atkins further alienated his colleagues by seeming oblivious to the chaos he created around him. While complaining about how the scandal was affecting him, he seemed incapable of noticing the effect his conduct had on the institution in which he served. Business in the General Assembly had been brought to a halt, resulting in a backlog of bills more typical of June than March. The only work being done concerned Mr. Atkins. At no point, I’m told, did he offer any contrition or sympathy to his colleagues for making their jobs so difficult. This in turn made it easier for them to conclude that it was time for John Atkins to step down. Finally, the brave letter from Dave Burris is universally acknowledged as having a powerful effect on the members of the General Assembly. Dave deserves every bit of the praise he has received for stepping forward and saying what needed to be said. He [Walsh] said the trades council supported the mailings and assisted NRG in getting them out because the council contends it is important to make sure beach residents hear both sides of the energy story. 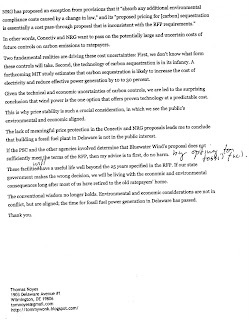 But David Walsh, director of the Delaware Building & Trades Council, accused "academics and activists" of distorting accounts about emissions and risks associated with NRG's proposal, and said the project would assure the region good jobs during construction and operation. While this quote is correct, Kempton said it was taken out of context from the original study on wind done by Kempton and other University of Delaware researchers. Kempton said the study went on to show many of these problems could be resolved and that wind would be a good choice for Delaware, but the brochure does not include any of those statements. “Having this one sentence represent my view is misleading,” Kempton said. Mike Rhue, a draftsman and self-proclaimed practical environmentalist, stood out in the crowd at a recent hearing as he explained in simple terms the problems with the applications and some possible solutions. Rhue said new technology, whether it’s new coal, natural gas or wind technology, can only be researched so much on the drawing boards. He said technology must be applied and used before all the bugs get worked out. “I can’t tell you what the price of coal is going to be in 30 years. I can’t tell you what the price of natural gas is going to be in 30 years,” said Rhue. But against such invincible odds, this small band of men chose to fight, and took the necessary action, even though outnumbered 10,000 to one, against the greatest army ever to land upon Grecian shores. Through strategic planning and personal courage, they stood fast against the onslaught and in doing so, changed the course of history. Now we too stand at a crossroads of civilization, where our choices and bravery will lead to great consequences. The nemesis we face, however, is one we have brought upon ourselves. Only a fresh puff of wind can break this downward trend. Blue Water’s generation plan can give us, this army outside your tent awaiting your decision, the extra economic lift it needs to face down the multitude of obstacles arrayed before us. Be known, that as you confer in your tent that is flapping in the stiff breeze, and ponder the subtle strategies arrayed upon the ground before you, that you have an loyal army of public opinion, over ninety percent, ready to take on any hardship, attack any risk, and march forward into any battle with you arm in arm, should you decide to lead us to renewable energy. We do it willingly, not for glory, not for honor, not for personal aggrandizement, but because we are truly in awe of the immense and profoundly global consequence that our small state’s actions may impart upon the future of all civilization. It's gratifying to see so much thoughtful comment being generated on Delaware's energy future. Thank you all. I am writing in support of wind power and opposition to the expansion of fossil fuel generation in Delaware. My views are informed by my experience in government negotiating environmentally complex, capital-intensive, long-term contracts, and also by the analytical tools I gained while earning an MBA in finance. The conventional wisdom is that the public’s environmental interest is in conflict with the public’s economic interest. But my review of the record leads me to conclude that the conventional wisdom has been turned on its head in this case; burning more fossil fuels doesn’t make economic or environmental sense for Delaware. Simply put, 19th century technology is not suited to meet the environmental and economic needs of the 21st century. This shift in the conventional wisdom is evidenced by the recent $45 billion private equity deal for TXU, which includes abandoning plans to build eight coal powered generating plants in Texas. Further evidence is provided by the rising chorus of business leaders, such as Jeff Immelt, the CEO of General Electric, speaking out in support of a national policy to control carbon emissions. The redactions of the proposals make it difficult for even the most informed citizen to evaluate the options. Even so, I am convinced that a compelling argument can be made that our long term economic and environmental would not be served by building more fossil fuel plants in Delaware. NRG, which wants to expand operations at its coal powered electric plant in Sussex County, is claiming that its proposal now before you will reduce air emissions. NRG's refusal to provide meaningful projections of future emissions makes it impossible to independently evaluate the company's claims. Looking at the chart, we don't know what emissions are measured, the scale or the base year. We don't know if this chart projects emissions in the company's proposal under current law or if it shows emissions using a future carbon capture technology. 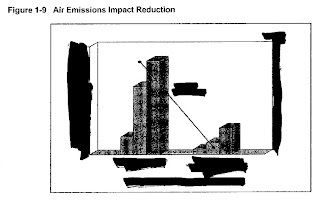 We don't even know if the illustrated reductions represent the new proposal or a combination of the new generating equipment combined with controls the company has already proposed to reduce mercury emissions, as noted here in April of last year. What we do know is that NRG is the perennial number one when it comes to air emissions in Delaware. Any other conclusion, given the company's refusal to release the most elementary environmental data, is guesswork. Similar uncertainties will affect the long term cost of energy of a new natural gas facility. But apart from the cost of carbon controls, it is unrealistic to assume that the price of gas will remain stable over the next 25 years. According to the U.S Department of Energy, the wellhead price of natural gas, measured in dollars per thousand cubic feet, increased from $0.44 in 1975 to $3.68 in 2000. Given the technical and economic uncertainties of carbon controls and the likely increases in the price of fossil fuels, we are led to the surprising conclusion that wind power is the one option that offers proven technology at a predictable cost. This is why price stability is such a crucial consideration, in which we see the public’s environmental and economic aligned. The lack of meaningful price protection in the Conectiv and NRG proposals leads me to conclude that building a fossil fuel plant in Delaware is not in the public interest. If the PSC and the other agencies involved determine that Bluewater Wind’s proposal does not sufficiently meet the terms of the RFP, then my advice is to first, do no harm by not saddling consumers with the economic and environmental costs of fossil fuels. These facilities have a useful life well beyond the 25 years specified in the RFP. If our state government makes the wrong decision, we will be living with the economic and environmental consequences long after most of us have retired to the old ratepayers’ home. The conventional wisdom no longer holds. Environmental and economic considerations are not in conflict, but are aligned; the time for fossil fuel power generation in Delaware has passed. Thank you for the opportunity to offer my views on this important decision. NRG, which wants to expand operations at its coal powered electric plant in Sussex County, is claiming that its proposal now before the Public Service Commission (PSC) will reduce air emissions. How much is none of your business. The News Journal reports that NRG has filed suit against the PSC to block release of environmental data related to the company's proposal. NRG's refusal to provide meaningful projections of future emissions make it impossible to independently evaluate the company's claims. Let's review what we don't know from looking at the chart. We don't know what emissions are measured. We don't know the scale or the base year. We don't know if this chart projects emissions in the company's proposal under current law or if it shows emissions using a future carbon capture technology. We don't even know if the illustrated reductions represents the new proposal or a combination of the new generating equipment combined with controls the company has already proposed to reduce mercury emissions, as noted here in April of last year. What we do know is that NRG is the perennial number one when it comes to air emissions in Delaware. Anything else, given the company's refusal to release the most elementary environmental data, is guesswork. Those global warming skeptics, darn them! I just knew one would say something so clever, so diabolical, that Al Gore would be forced to admit it’s all a big hoax. Displaying a photograph of icicles in Buffalo, Inhofe demanded: "How come you guys never seem to notice it when it gets cold? Yeah Al; why is it cold in Buffalo? Have you thought of that? Weather is what’s happening in a specific place at a specific time and changes moment by moment. Climate encompasses the entire planet and changes slowly. The overall temperature of the planet Earth might change by a fraction of a degree over the course of a decade. Not in the most dire worst case scenario, with the glaciers gone and the ice caps melted, is it imagined that the climate could change so much as to preclude the formation of icicles in Buffalo. A sour Dennis Hastert (Ill.), the former House speaker, called him "a personality and now a movie star." "Rin Tin Tin was a movie star," Gore demurred. "I just have a slide show." The Public Service Commission (PSC) is accepting comments on the three energy proposals under review through Friday, March 23. To encourage submissions, I announced the TommyWonk Energy Essay Contest. Send me your comments, and I will post them here. The selection between NRG (coal), Bluewater Wind and Conectiv (natural gas) bids for Delaware’s future electricity generation will take place imminently. This is to urge you to do all you possibly can to have our decision makers select Bluewater Wind energy for Delaware’s next choice of cost effective, environmentally friendly, long-term electric generating power source. This is really where the rubber hits the road. Wind is clean, renewable and very competitive. In fact, it is hands down, the very best way to go for Delaware. Wind is non-polluting. One must ask how much pollution costs the state of Delaware in terms of health care costs, clean up costs, regulatory costs and so forth. 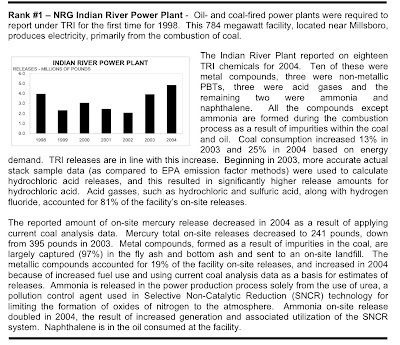 Greenhouse gases are not produced by wind power; not so with NRG’s coal power. There is some lip service about capturing and sequestering the CO2 produced in coal gasification but it is simply nonsense. There is no practical way to sequester CO2 in Delaware at this time, but for argument’s sake if it were possible now to do so, by Morton Sissener’s own account 35%-40% of carbon emissions would still escape into the atmosphere. Sissener is the Director of Development for NRG Energy. IF it were possible to sequester the CO2, NRG states it would only do so if required, AND if the costs were borne by the ratepayer. The costs have been estimated to be many billions of dollars. Very Expensive. Now imagine the cost to Delaware of Global Climate Change. There is an overabundance of good science that stresses the urgent need for us to stop these greenhouse emissions and this is an opportunity to do so. Wind power is the way. In terms of other environmental impacts, coal extraction is devastating mountaintops, leaving vast amounts of our landscape raped and damaged. Wastes are dumped into valleys and streams. Underground mining is a deadly occupation. Coal dust from the transport and subsequent storage of coal, adds particulate matter to our air. This causes major respiratory health problems for the citizens of Delaware. This is unacceptable. Even with the new IGCC technology proposed, the NRG facility will still have vastly greater air emissions than an equivalent amount of wind energy, which has NO emissions. Conectiv’s Natural Gas bid is also very problematic when compared with wind energy. Natural gas is a fossil fuel and therefore it is polluting. There is also the issue of national security as we get much of our gas from the same countries that are a potential threat to our nation. The price of natural gas as well as coal fluctuates, unlike wind. A robust investment in wind power would make Delaware a fine model for the rest of the country to emulate, along with other environmentally conscious states who realize we have no time to waste and NOW is the time. It is time for clean, renewable, non-carbon based energy. A recent proposal for offshore wind energy would provide enough energy for 130,000 homes. This, from a non-polluting source! Wind is here, it is free from Nature, and we can “harness” it now. We need to increase our energy efficiency and simultaneously make the transition from fossil fuels to clean, renewables. Now is our opportunity. It’s the right thing to do, it’s the smart thing to do; it’s the economical thing to do; it’s the moral thing to do. I hope you will do everything you can to ensure a healthy future for our children. Well said Ellen, and thank you. Comments to the PSC can be submitted to karen.nickerson@state.de.us, and to me at tomnoyes@gmail.com. We were told Iraq was aiding and abetting al Qaeda. We were told Iraq was developing and stockpiling weapons of mass destruction. We were told that by toppling Saddam Hussein, we would unleash forces of freedom and democracy that would transform the region. We were told we would be greeted as liberators. We were told the insurgency was in its last throes. What we have found is very different. We have failed to find any WMDs, failed to identify any connection between Iraq and al Qaeda, and failed to transform the Middle East into a garden of democracy and freedom. Instead, we're caught in a bloody sectarian civil war that has nothing to do with our reasons for going in. Iraq had not attacked us, was not planning to attack us, and did not have the means to attack us. But our president insisted we had to go to war. It was a war of choice, and he chose. Unfortunately, the Iraq debacle has affected out ability to act in our interest elsewhere. Instead of strengthening our hand in the Middle East, our presence in Iraq serves to advertise our weakness in the region and around the world. More than 3,000 of our young men and women have paid for this folly with their lives, and more bear the cost of broken bodies, brain damage and official neglect. Four years later, the best our president can do is to plead for patience. The answer, sadly, is no; as a nation, we are not better off than we were four years ago. First up is a terrific essay by Dave Woodside, proprietor of LiberalGeek, who has been helping to keep Delawareliberal up and running during Jason's sabbatical. We tend to have this vision of energy as a rare and wonderfully complicated thing. In reality, we see energy in almost everything. Poets write lovingly of the sun on their faces, the wind in their hair and the surf pounding on the shore. All of these are energy. We have created energy by burning things since the discovery of fire. It is a simple and powerful model that we have harnessed in amazing ways: from a massive network of interconnected power grids to putting men on the moon. But our simple model is beginning to fail us. The problem that we now face is twofold. First, the scale at which we burn things is doing damage to our planet. Whether one agrees with global warming or not, pollution's effects on the planet and humans is unchallenged. Second, the things that we burn these days are finite. Whether you believe that we have 50 or 100 years of fossil fuels, you must believe that we will run into a situation where the scarcity of the fuels will, in the foreseeable future, impact our way of life in profound ways. The amount of pollutants released by coal plants is sizable. One of the stories that I find most illustrative of this point occurred several years ago during a massive power outage. The power grid failed spectacularly on August 14th, 2003, blacking out huge portions of the Northeastern U.S. As a result, over 100 coal-fired power plants in the Ohio valley went offline and stopped burning fuel. These are the effects of just 24 hours offline. The effects are immediate and close to home. Imagine if we could take those plants offline 100 days a year. Or 200 days a year. These are achievable goals. Fossil fuels are finite. In many cases they are not yet scarce, but their increasing scarcity has influenced geopolitics and global economics, caused massive environmental losses and cost thousands of lives in the defense of the free movement of fuel. Oil may have already peaked in production. If not, the growing demand of China, India and Europe are certain to hasten a day of reckoning. "Peak Oil" may be decades off, but it is coming and we will need to be ready. While the scarcity of coal is nowhere near the situation with oil, it hosts its own issues. Environmental impacts of mining, health effects on miners, and loss of earth formations through mountaintop removal all extract a high price. In addition, there have been discussions of "carbon taxes" that could add an artificial cost to monetize the actual environmental damage done by massive CO2 emissions. Natural gas is dealing with a scarcity problem as well as a transport issue. The estimated world reserves of energy from natural gas is just over half of that of oil. Pipelines carry natural gas across this country and the price increases as you move away from Texas due to the length of the pipeline. We are not close to Texas. Anyone that has been reading the papers in the past few years knows the issues that alternative methods of transporting natural gas are difficult to complete, especially here in Delaware. There are non-polluting, virtually inexhaustible sources of energy available. These harness geology and astrophysical sources of energy to convert to electricity. Gravity drives hydro-power and tidal turbines. The sun drives photovoltaics, heat-exchangers and even wind turbines. Neither of these sources are in danger of exhaustion in the foreseeable future. And if they did, we have much bigger problems. Finally, there are fusion and fission to harness the energy that is elemental to this universe. Ultimately these may be the answer, but the technology has not yet developed to a point that they are technologically and/or politically feasible. Of the three proposals on the table for the first state of the union, only one is based on a view forward to a day when energy and environmental concerns are in balance. The proposed wind farm would harness 1/3 of the available energy to be harvested in the Delaware offshore. Additional fields can be installed down the road to actually feed additional energy into the grid. Even if we can turn off some of the Ohio Valley power plants a few days a week. We are making our air cleaner, our water safer, our citizens healthier and our sky bluer. Delaware has an opportunity to install a forward-thinking, fixed cost, aesthetically pleasing and safe power plant. We should grab this opportunity and make a bold statement to the rest of the states that there is a reason that we are the first state. As with the ratification of the Constitution, we as a people, know a good deal when we see it. We know when to stand up first and say "I'm in." This is that time. Bravo! Dave has set a high standard for the rest of us. Comments to the PSC can be submitted to karen.nickerson@state.de.us and to me at tomnoyes@gmail.com. But after lawmakers backed measures to delay or kill the restriction, John A. Hughes, secretary of Delaware's Department of Natural Resources and Environmental Control, announced the new schedule at a news conference Thursday afternoon. "This gives us a second chance to work together on this issue," Hughes said. Earlier this week, Diana McWilliams and 16 colleagues filed a resolution to postpone the ban until June 1, and create a task force to find alternatives to landfilling. As I’ve noted before, Wayne Smith made forcing the DSWA to landfill the single largest category of recylable material his number one priority. McWilliams, along with Helene Keeley and Gerald Brady, had previously presented an amendment that would have the same effect as the resolution. HB 1 would have forced the Delaware Solid Waste Authority (DSWA) to accept yard waste at Cherry Island in perpetuity. By making this bill the first filed in the session, Wayne Smith pulled off the unlikely feat of making the DSWA look positively progressive in comparison. The delay comes as DNREC is preparing a bill to finance state recycling programs through a $3 waste surcharge, an effort that could have become a legislative hostage with the yard waste dispute unsettled. Citizens now have one week to submit their comments on the energy proposals to the Public Service Commission. (The PSC's contact information is available here; comments can be submitted to karen.nickerson@state.de.us). The PSC has heard from hundreds of citizens, and is posting all public comments on its Website, where the public record now runs to several thousand pages. The Public Service Commission called Wednesday for public release of more details from three bids for a Delmarva Power generating contract, but stopped short of supporting wholesale release of prices, costs and other financial details. The recommendations, to be considered by the PSC at a meeting Tuesday in Dover, appeared to fall heaviest on NRG Energy, which has proposed a more than $1.5 billion plant to burn a synthetic, natural gas-like fuel near the existing Indian River power complex near Millsboro. Among the items recommended for release were the plant's potential emissions and some details about plans for injecting carbon dioxide into deep, brine-water wells more than 4,000 feet below Millsboro. I’d be interested seeing Mr. Walsh’s unredacted comments to learn specifically who he thinks is distorting which facts. I imagine, or at least hope, he wasn’t seeking to drive a wedge between the labor and environmental movements in Delaware. To be fair, even my written remarks from last week were redacted for brevity: I’ll be submitting more extensive comments next week. You should do the same. Disclaimer: TommyWonk reserves the right to edit submissions for length, content or quality of writing. Thoughtful, well written comments will be given their due recognition. But several former Army officials who have worked at Walter Reed — which Lt. Gen. Kiley ran in a previous stint that ended in 2004 — say he has known about the problems at the hospital since 2003. And even last week, as the Pentagon promised swift action, Lt. Gen. Kiley was publicly blasting The Washington Post for what he called "one-sided reporting." 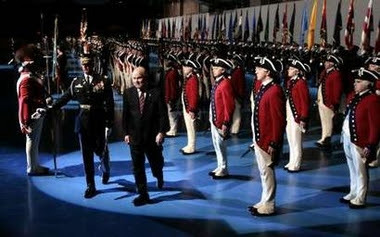 So the decision to have Lt. Gen. Kiley lead Walter Reed in the interim has left some senior Pentagon officials fuming. One said, in private, "they fired the wrong guy and promoted the wrong guy." Today, as the New York Times and the rest of the world are reporting, Defense Secretary Robert Gates fired the right guy. General Kiley had replaced Maj. Gen. George Weightman, who had been in command at Walter Reed for only six months. Not content to be unceremoniously dumped, Mr. Harvey treated himself to a farewell extravaganza on Friday that added insult to injury for those who have suffered from his neglect. It was wall to wall policy wonks last night at the PSC's hearing on energy options for Delaware. Most of the speakers instead said they liked a proposed wind farm that would feature 200 turbines in the Atlantic Ocean off Rehoboth Beach or Bethany Beach. "The conventional wisdom is that the public's environmental interest is in conflict with the public's economic interest," said Tom Noyes, of Wilmington. "But my review of the record leads me to believe that the conventional wisdom has been turned on its head in this case. Burning more fossil fuels doesn't make economic or environmental sense for Delaware." And Ellen Lebowitz of Newark said global climate change could wreak havoc on the state's coastline. "Wind is here. It's free from nature. We can harvest it now," she said. Several people spoke up for the NRG proposal. Robert Carl, business manager of Local 42 of the Heat & Frost Insulators & Asbestos Workers, praised the potential of "clean coal" to produce a "ripple effect" in the economy by creating good paying jobs. "NRG's commitment to clean fuel seems to be on the right path," he said. I was impressed by, and learned a great deal from, many of the speakers, many of whom had clearly done their homework. Public Service Commission staffers are expected to call for the release of a substantial amount of information being withheld by companies vying to build a new power plant, a top commission official said Thursday. The information -- including how the projects would be financed, costs of electricity they would generate, and the amount of pollution they would emit -- has been blacked-out from documents because the companies claim releasing it would put them at a competitive disadvantage. I’m Tom Noyes, and I speak as a private citizen. My views are informed by my experience in government negotiating environmentally complex, capital-intensive, long-term contracts, and also by the analytical tools I gained while earning an MBA in finance. This shift in the conventional wisdom is evidenced by the recent $45 billion private equity deal for TXU, which includes abandoning plans to build eight coal powered generating plants in Texas. Further evidence is provided by the rising chorus of business leaders, such as GE CEO Jeff Immelt, speaking out in support of a national policy to control carbon emissions. The result seems inescapable: The NRG and Conectiv proposals offer no meaningful price stability to ratepayers. In particular, NRG and Conectiv seek to place the entire economic burden of compliance with future controls on carbon emission squarely on the shoulders of consumers. Conectiv is seeking recovery of possible future carbon taxes. In other words, Conectiv and NRG want to pass on the potentially large and uncertain costs of future controls on carbon emissions to ratepayers. Two fundamental realities are driving these cost uncertainties: First, we don’t know what form these controls will take. Second, the technology of carbon sequestration is in its infancy. A forthcoming MIT study estimates that carbon sequestration is likely to increase the cost of electricity and reduce effective power generation by 10 to 30 percent. Given the technical and economic uncertainties of carbon controls, we are led to the surprising conclusion that wind power is the one option that offers proven technology at a predictable cost. This is why price stability is such a crucial consideration, in which we see the public’s environmental and economic aligned. The lack of meaningful price protection in the Conectiv and NRG proposals leads me to conclude that building a fossil fuel plant in Delaware is not in the public interest. If the PSC and the other agencies involved determine that Bluewater Wind’s proposal does not sufficiently meet the terms of the RFP, then my advice is to first, do no harm by opting for fossil fuels. Citizens have another opportunity to speak on the energy proposals. The hearing scheduled for last Wednesday has been rescheduled for Monday, March 12, 2007 at 7:00 p.m. at Del Tech's Georgetown Campus. Have you ever wondered about the home settings where Delaware's star bloggers did their work? I haven't, but Gary Soulsman has. Writing in the News Journal, Gary describes the habitats of the bloggers responsible for More useless yet interesting info from Delaware, Kilroy's Delaware, Meet Bob Archer and TommyWonk. The spaces described are as diverse as the blogs. Maybe we should start a kitchen tour. Righty and lefty bloggers in Delaware have developed the unique habit of linking to each other; I suppose it's time for messy and neat bloggers to follow suit. In that spirit, I am adding Frank, Lee aka "Bob" and John aka "Kilroy" to my blogroll. A senior White House official is found guilty of lying to the FBI and a grand jury. Congress is looking into the abrupt dismissals of eight U.S. Attorneys. President Bush creates a bipartisan commission to investigate the failures in medical care for the men and women who serve in uniform. Conservatives properly distance themselves from the offensive comments of Ann Coulter. It's called accountability. It works, when given a chance. The most significant non-conformity (of two mentioned) in Bluewater's proposal is its generating capacity, which is lower than specified. The most significant non-conformities (of five) in Conectiv's proposal are its proposed natural gas-based one-time pricing adjustment which "raises concerns about the energy pricing," and its seeking recovery of possible future carbon taxes. 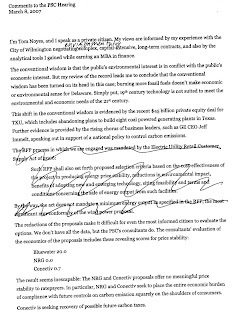 The most significant non-conformities (of four) in NRG's proposal are its proposed exception from provisions that it "absorb any additional environmental compliance costs caused by a change in law," and its "proposed pricing for [carbon] sequestration is essentially a cost pass-through proposal that is inconsistent with the RFP requirements." It's hard to offer an informed analysis of each category, particularly given the redaction of the proposals, but one result seems inescapable: The NRG and Conectiv proposals offer no meaningful price stability to ratepayers. In particular, NRG and Conectiv seek to place the entire economic burden of compliance with future controls on carbon emission squarely on the shoulders of consumers. The News Journal today ran two significant stories about the economics of the energy options on the table; one on the reports from the consultants hired by the Public Service Commission (PSC), the other on the difficulties faced in evaluating the economic merits of the proposals. I'll have more on the PSC's consultant's report in the near future. Coal mining is particularly destructive to the environment. About 60 percent of U.S. coal is stripped from surface mines. The rest comes from underground mines. Surface mining, especially mountaintop mining, dramatically alters the landscape and wastes are often dumped into valleys and streams. In West Virginia, more than 300,000 acres of hardwood forests and 1,000 miles of streams have been destroyed by this barbaric practice. The destruction of forests also contributes to global warming, erosion and flooding. 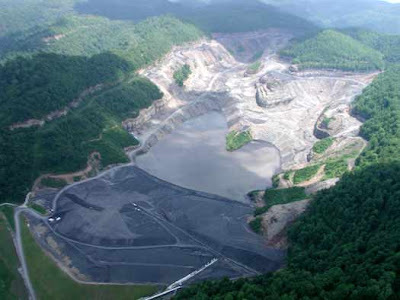 The practice is called mountaintop removal; the horrific results are visible from earth orbit. This manmade lake of untreated waste sits directly upstream from the town of Whitesville, WV. 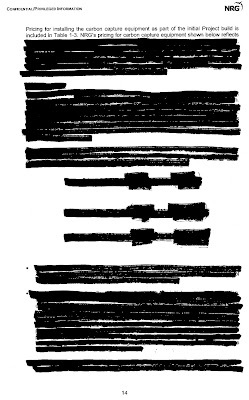 As you can see the bidders have redacted the public versions of their bids, contending that the omitted portions contain financial or commercial information which is of a privileged or confidential nature and hence not a public record. 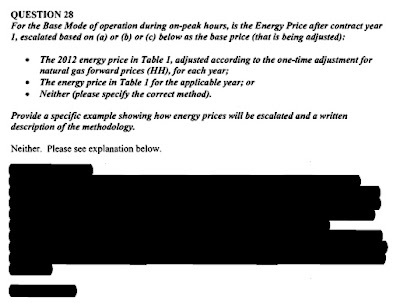 Blue Water Wind at least had the good taste to blank the redacted portions instead of using ugly black smudges: If you have the time and the inclination to pore through these documents, you will learn a lot, including how much the bidders don't think you need to know. I think of TommyWonk as occupying a modest niche in the blogging ecosystem, which makes it fun to note those occasions when my little blog rises to the top of the Google search results for specific topics. I certainly can't claim any original thought in either of these posts. But somehow what I wrote fit the specs for these searches. It's easy to think of blogging a transitory phenomenon, but through the magic of the Google, at least some of what I write has a shelf life that lasts longer than the news cycle.